Summary: When the marriage of Mariah White and her cheating husband, Colin, turns ugly and disintegrates, their seven-year-old daughter, Faith, is there to witness it all. In the aftermath of a rapid divorce, Mariah falls into a deep depression - and suddenly Faith, a child with no religious background whatsoever, hears divine voices, starts reciting biblical passages, and develops stigmata. And when the miraculous healings begin, mother and daughter are thrust into the volatile center of controversy and into the heat of a custody battle - trapped in a mad media circus that threatens what little stability the family has left. My Review: Mariah White is head-over-heels in love with her husband (to a sickening point) and then she catches him cheating and completely falls apart. While she is in her self-loathing stage, her daughter, Faith, who also witnessed the affair, starts talking to her "guard". It seems quite normal that a little girl would develop an imaginary friend after such a traumatic event but when Faith, who has never been told of God, starts reciting Bible verses, Mariah seeks help. It turns out her "guard" is actually her God. Once this is declared all kinds of crazy events take place, including healings and stigmata. Faith's extraordinary story is leaked to the media and all types of people attempt to reach Faith to figure out what is actually going on with the little girl. Among these people is Ian Fletcher, who makes a living as an atheist disproving Christianity on live television. Also introduced into the story is Father MacReady to clear this mystery up for the Catholic church, even though the girl is not Catholic but technically Jewish. So Rabbi Weissman steps into the story for the Jewish perspective. While the main story line is intriguing, there are so many side stories taking place that don't tie well with the main story line, that the reader feels distracted. It was difficult to care for Mariah because she was so needy and weak at the beginning of story. And her transformation to a stronger, more independent woman is slow coming and incomplete. Father MacReady and the whole Catholic church side story add little to the book and I feel could have just been cut or mentioned in a less detailed manner. Rabbi Weissman fits well because Mariah is Jewish and his character is very likable, but he pretty much just drops out of the book during the second half. And while I can't say that I liked Ian Fletcher, I do think his character fit nicely with the story and added another dimension. That being said, Picoult has an excellent writing style that keeps the reader intrigued regardless of the subject. She has a way of making you think about things from a new perspective. 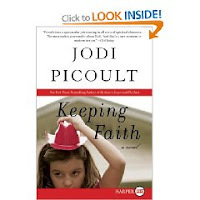 I liked how she weaved two sides into "Keeping Faith"...keeping faith from a religious stand point and keeping Faith as in child custody. This novel had so much potential but left the reader wanting for something more. My Rating: 3 Stars, definitely not her best book but if you enjoy her writing, check it out. If I could sum this book up in one phrase it would be: A good story, just rough along the edges. Summary: Is Nick Allen a troublemaker? He really just likes to liven things up at school--and he's always had plenty of great ideas. When Nick learns some interesting information about how words are created, suddenly he's got the inspiration for his best plan ever...the frindle. Who says a pen has to be called a pen? Why not call it a frindle? Things begin innocently enough as Nick gets his friends to use the new word. Then other people in town start saying frindle. Soon the school is in an uproar, and Nick has become a local hero. his teacher wants Nick to put an end to all this nonsense, but the funny thing is frindle doesn't belong to Nick anymore. The new word is spreading across the country, and there's nothing Nick can do to stop it. 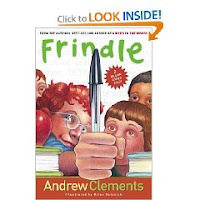 My review: Frindle is a quick read and the heartwarming story of an resourceful and gutsy 5th grader who decides to put what he learns in school to the test. Who says what a word means? We do. If that is true, can he make a new word? His efforts to further his experiment are creative and hysterical and you can't help but fall in love with him for all the trouble he causes. I don't doubt that all his teachers secretly loved him as well for his wit, ingenuity, and that spark of mischief inside him. Of course, every story has a villain and this ones is Mrs. Lorelei Granger--dictionary lover, wordsmith extraordinaire, and Nick's current language arts teacher, who insists that he cease and desists all his frindle-ish efforts. There is, she says, quite simply, no need for new and frivolous words in the English language. And so the Battle of Frindle begins, and when it ends--and I mean really ends--I got a little misty. I really enjoyed this story. Overall, Frindle has a touching message about the power of the English language and the power that we have to change it. NOTE: I think that secretly I wanted to be him in school. The one who made everyone laugh. I was the geek. The one who made everyone laugh, but for significantly more humiliating reasons. If I could sum this book up in one phrase it would be: Simply gagarificious! Summary: In a fragile world on the brink of World War II, lovely young Englishwoman Ellen Carr takes a job as a housemother at an unorthodox boarding school in Vienna that specializes in music, drama, and dance. Ellen simply wants to cook beautiful food in the homeland of her surrogate grandmother, who had enchanted her with stories of growing up in the country side of Austria. What she finds when she reaches the Hallendorf School in Vienna is a world that is magically unconventional--and completely out of control. The children are delightful, but wild; the teachers are beleaguered and at their wits' end; and the buildings are a shambles. In short, the whole place is in desperate need of Ellen's attention. Ellen seems to have been born to nurture all of Hallendorf; soon everyone from Leon the lonely young musical prodigy to harassed headmaster Mr. Bennet to Marek the mysterious groundsman depends on Ellen for --well, everything. And in providing all of them with whatever they need, especially Marek, for whom she develops a special attachment, Ellen is happier than she's ever been. But what happens when the menace of Hitler's reign reaches the idyllic world of the Hallendorf School gives this romantic, intelligent tale a combination of charm and power that only the very best storytellers can achieve. Rules for Reading (and Loving) a book. 1) Don't try to read anything in the month of December. You'll never get more than three pages read at a time. There's just too much to do and you'll never connect with the story. 2) Never read a similar book..or one by the same author..immediately after reading a book you LOVED. It will ALWAYS pale in comparison. 3) If you don't like to read about the Holocaust...don't try to make yourself. It. won't. work. Okay. I pretty much think that the above says it all. I tried to read it. I tried to like it. It took a while and I even got pretty into it for about 60 pages. For me, not liking this book was simply a matter of taste and choice. It all goes back to a post-partum Me reading what was supposed to be a retelling of Sleeping Beauty called "Briar Rose" by Jane Yolen. It was a very good retelling but there was great deal of throwing babies into brick ovens and I swore off books even remotely related to that time period from then on. My heart quite simply cannot take it. So needless to say the time in which this book was set was a huge distraction for me. Like an irritating bug bite...it's always there. Itching. That having been said, for those of you for whom the setting of this book is NOT a deal-breaker, I'll try to be a little less biased. "A Song for Summer" meanders its way along in a sort-of slow, comfortable fashion. The first 100 or so pages of this book are very charming, and well-written but lacked the same pull and "right away" enchantment as I've felt reading some of her other books. I really enjoyed reading Ellen's descriptions of her first views of Hallendorf and her dreams for it. The children and teachers at the school were all unique characters that were easy to picture and love (with the odd nutter among them). I didn't really get involved in the book until about 120 pages in when the action starts (a very little) and 160 when Ellen finally starts to display a little bit of backbone. Her character up to this point seemed pretty perfect--the content, homemaker and genuinely kind individual--which lets face it, none of us are. As the threat from Nazi Germany increases, Ellen is forced to choose whether she will stay in her idyllic world or venture out in a far more dangerous attempt to help a friend. Here are the 60 or so pages where I was able to read continuously and felt sort of connected with the story. After that it kind of fell apart for me. It could have been the story. It could have been the fact that Christmas was coming and I didn't sit down for more than five minutes a day. Ellen and Marek definitely had their moments, but the chemistry between them was inconsistent...there at times and absent at others. I'm also a huge fan of the happy ending....and I don't like being teased about it. Frequently, just as they were about to get their happy ending- time after time - it was yanked out from under them. Another little bug bite. Unfortunately, for much of this book I didn't not feel like a I was a part of it...I felt like I was reading it. Gasp. I'm sure some of you understand what I mean. I want to be completely absorbed...drawn so fully into a book, its' plot, characters, and storyline, that I actually have to blink and look around when I am forced to put it down. Alas, I did not find it with this book. Anyway, I'm sorry this review isn't better. I don't know how qualified I am to give it because of how disconnected I felt, how busy I was, and my prejudice against the setting, so take it for what its worth. You might adore this book. Many others have. If I could sum this book up in one phrase it would be: I wanted to like it more than I actually did. Summary:David Beck has rebuilt his life since his wife's murder eight years ago, finishing medical school and establishing himself as a pediatrician, but he's never forgotten the woman he fell in love with in second grade. 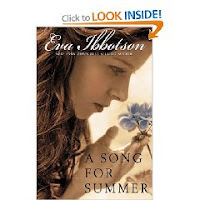 And when a mysterious e-mail arrives on the anniversary of their first kiss, with a message and an image that leads him to wonder whether Elizabeth might still be alive, Beck will stop at nothing to find the truth that's eluded him for so many years. A powerful billionaire is equally determined to make sure his role in her disappearance never comes to light, even if it means destroying an innocent man. My Review: Elizabeth and David made annual pilgrimages on the anniversary of their first kiss to his family’s property site at Lake Charmaine. They had been married seven months when it happened. Elizabeth was abducted, and later found to be the victim of a serial killer. David had been knocked unconscious and had fallen in the lake only to awaken in a hospital. The story opens eight years later when David, now a pediatrician, receives a bizarre email. The message is clearly from someone who knows intimate details of his life with Elizabeth. A subsequent email shows Elizabeth on a busy street mouthing to him the words that she is sorry. Other instructions plus the admonition to “tell no one” arrive through an email account that can only be traced to an alias. 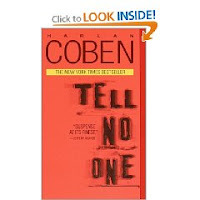 Tell No One is slowly and artfully constructed and the tension is sustained throughout. The author manages to work in current social issues in a noninvasive way and the story is stronger for it. The well developed characters’ dialogue is consistent and intriguing. While the ending is predictable, the way you arrive there is definitely not. Personal Note: Although I found this interesting and a slight left turn from his regular work, he does have me wondering if he will fall into the predictability rut that so many Mystery writer have. If I could sum this book up in one phrase it would be: A roller coaster that is not quite as intense as it looks. 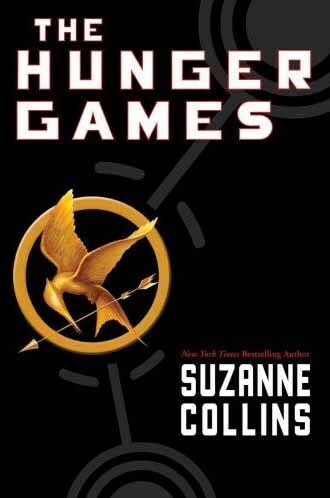 My review: It happens once a year--the Reaping—a drawing to decide who will live and who will fight to the death in a teenage survival nightmare called the Hunger Games. Katniss Everdeen, her family’s sole provider, steps forward to volunteer when her little sister’s name is drawn and is forced into the fight of her life—FOR her life. Twenty-four children will enter the arena. Only one will make it out alive. As the story progresses the rules change, alliances are formed, and Katniss must decide how SHE will play the games and if she can live with the choices she makes. It’s been a long time since I’ve read a book like this—one that makes my heart pound nearly every second that I’m reading it….and a little bit when I just think about it. I stayed up until 3AM –usually a good indicator of a book’s hold on me—and had to finish it as quickly as possible the next day. S.C.’s idea of the Hunger Games was unique and, as a plot tool, she set it up to allow for a great variety of unexpected things to happen. There is very little I can say without ruining things, but Katniss has to exercise all of her cunning and bravery to survive, not only what the contestants dish out to her, but what the Game makers throw at her as well. She learns quickly to work the viewers and her “sponsors” into getting the things she needs. It was always interesting to see what would be dropped from the heavens…and what they had to do to get it. The fact that this book was set in the future also gave S.C. a great deal of freedom as far as believability was concerned and she ran successfully with it. Her mockingjays and tracker jackers blend seamlessly into the story and the end result of her efforts is a creative survival story similar to “Lord of the Flies”. It was disturbing in both its intensity and imagery but very driven by a strong, unpredictable plot and some very likeable (and dislikable) characters. Hunger Games is filled with gut-twisting tension until the very last page and still left me cursing the fact that Book Two isn’t out yet. I’m going to die waiting. I just know it. As a nation, and perhaps a world, we are obsessed with getting the “fishbowl” perspective on things. Somehow we fool ourselves into thinking that these shows are “REAL” when in fact they are nothing of the sort—merely manipulated by the people that pull the strings and push the buttons behind the scenes—regardless of the lasting effects on participants. I can’t help but think what people today might think of this kind of thing. We film the pain of a break up, the embarrassment of a moment of clumsiness—all for FUN. What about Survivor, dog fighting, and the Ultimate Fighting Championship. They all draw huge crowds and offer entertainment based on violence and injury or on the manipulation and exploitation of others. How much of a step would we really have to take to have something like this? My rating: 4.5 stars. I really really really liked this book. I don't really think that there was a way to make this book less graphic without losing it's intensity but I'm a little worried about it's affect on a younger audience. It's characters make it seem young adult...but just make sure its not TOO much for YOUR young adult. If I could sum this book up in one phrase it would be: If I didn't have to be a responsible parent, I would have stayed up ALL night long. Summary: Stephanie Plum is a little lady with a big attitude. And now that she has lost her job as a lingerie buyer, she has big money problems. Desperate times call for desperate measures and Stephanie decides to take a bail-bond recovery job from her cousin Vinnie. If she can catch the bail jumper, the payoff will be huge. However this is a jumper she may not want to catch. Stephanie has known Joe Morelli since childhood. They even entered into a romance that resulted in Stephanie hitting him with her father's Buick. Now this cop is wanted for murder. 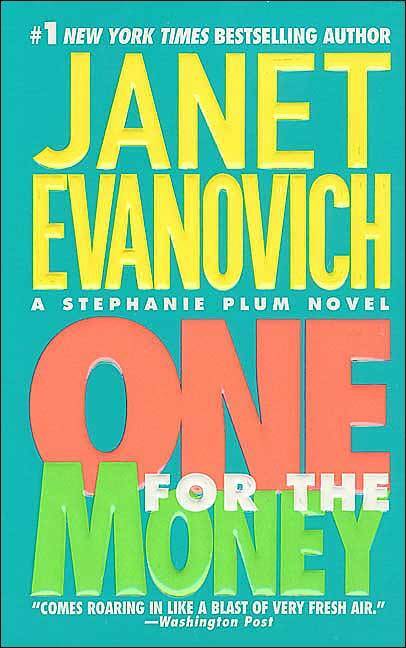 To get her money Stephanie must catch Morelli within a week, without first getting herself killed. 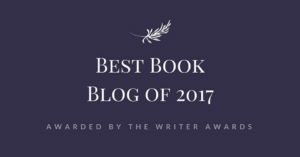 My Review: I feel Mindy's food analogy fits well here. I liken this series to eating mashed potatoes...little, if any, nutritional value but still comfortingly full of calories. There are fourteen of these books in the series so far and I can eat through an entire one at a sitting. These mystery stories are full of humor and each contain touch of romance. The best way to describe these books is to just introduce you to the quirky characters. Joe Morelli: Super hunky bad boy from Stephanie's past turned cop turned murderer? This is a fun, fast read that has you guessing who-done-it until the end. I would recommend these books to anyone looking for a light, no-thinking read (and a good laugh). P.S. 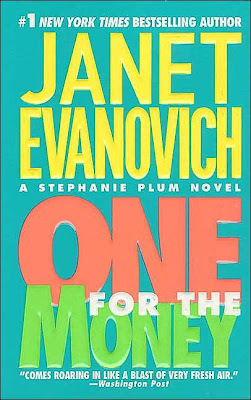 You don't necessarily need to read these in order, although I would suggest reading "One for the Money" first to get acquainted with the characters. My Rating: 4 The first one isn't my favorite in the series but still a great read. I would rate all of these between 3.5 and 5 stars for this type of book. I have decided to stop reviewing the Once Upon a Time series. There are so many of them that I've gone all muddled in the head about it. I can't keep them straight from one book to the next and I figure it's time to move on. They are starting to blur--so I'm taking a break. I'm going to read them when I can but probably won't review anymore unless I get some screeching comments about it. Odd's are they are all fun to read and a great way to pass the afternoon (especially the ones by Cameron Dokey). 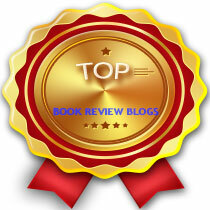 If you are interested, here is a link to those I haven't reviewed. 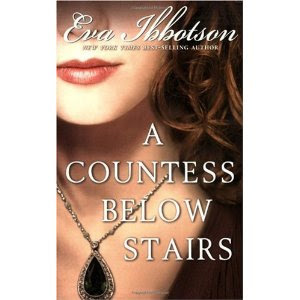 My review: "A Countess Below Stairs" is the tale of a an impoverished Russian countess who takes a job as a maid in the home of the handsome Earl of Westerholme to provide for her family. It's obvious to all who work in the household that Anna is highborn and they don't expect her to last, but last she does and, in so doing, captures the hearts of her fellow staff and the attention of the Earl...but not without consequences. Ibbotson's characters are amazingly loveable and so real they stand up, fully clothed, in your mind. Honorable Olive Byrnes, an eight year old it is impossible not to love. The efficient yet stodgy butler, Proom, who by the end of the story is up to his elbows in deceit and feathers. Mrs. Proom, mother of the butler, who is most often found throwing a variety of things out the window to get the attention of passersby. James, the footman whose obsession with the size of his muscles is equalled only by the maids' interest in them. Lady Lavinia, twenty times a bridesmaid, homely, and desperate to marry, well, anyone above her station. Dr. Lightbody, an insanely misled freak if there ever was one. Uncle Sebastien, a lecherous old musician whose tendency to pinch the maids is okay by them. Muriel Hardwicke, the Earl's seemingly sweet fiancee, who transforms herself over the course of the book from a gorgeous, wealthy fiancee to a malicious woman who makes it SO easy to hate her. Rupert, the Earl of Westerholme, engaged to marry a woman whose riches will save the estate, but torn between his heart and his duty. And above all, Anna, the beautiful, kind, and indominitable Countess, determined to make her way and help those she loves. I'm sure I could make this review calm and collected. I could write something articulate and rational and astound you with my observational wit. I have absolutely no intention of doing any of these things because I am all aflutter. I am in LOVE with this book. To be honest this was pretty much love at first word for me. I knew it was something special when I read--not the prologue--but the little exerpt that comes before any of that and could tell the writing would be phenomenal. Usually when I am reading through a book, especially to review it, I keep a running list of things I like or dislike about the book in my head or on paper. I was completely unable to do it this time. I got so swept up in the story that try as I might I could not find anything wrong with it. Yes, I know that no story is perfect, but when you get so immersed in a story that you can't even manage to surface for a moment of mental clarity...that is a good story. I read till 3. I forced myself to go to bed. I woke up. I ignored my kids. I ignored my husband. I skipped dinner. Make no mistake...this is book isn't chock full of meaning or symbolism. It isn't depressing or all about the trials we face as people. It's just good fun. Read it. Read it. Read it. I sincerely doubt that you'll be sorry. Sum it up: Perfect in every respect.